We have a vast range of courses that are based on more than 40 years of experience in audio, mixing consoles, speakers, room acoustics, psychoacoustics, installations in churches and concert halls. Our international experience and expertise from many areas is unique. Do you want to create a better sound in the church, or perform better as a sound engineer? Then, one of the following courses should be of interest to you. We have a number of courses that are designed for those who want to better understand what it takes to create a better sound in the church. It is common practice to focus solely on technology (equipment) but there are more important factors. The courses provide a good background to the audio and sound experiences and what really creates a better sound and makes you understand and remember what is being said or played. Those who have attended the courses are often “astonished” that they could “forget” so many important factors that are often simple and cheap to handle. The courses are designed for the practical interested and the entry requirements are low. If you want to know what to do to become successful in getting a better sound, enroll in our courses. We often collaborate with course teams in arranging these courses. 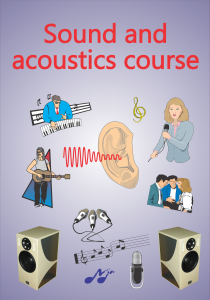 This course provides an overview of the most important factors that govern what is required for a good sound. The course has a strong emphasis on the importance of cooperation in which the performers must work with those who manage the sound. It is only then that one can make it sound really good. This collaboration is an important factor that is often forgotten. An introduction to speech perception, intelligibility and the factors that govern this. Many real examples are from different churches and venues to illustrate why it is becoming such a big difference. At the end of the course are also given some demonstrations where some important psychoacoustic effects are demonstrated. These demos usually create great discussions and amazement but also provides an insight into the existence of factors other than purely technical that control the end result — a much better sound. Pre-knowledge: An interest for a great sound and what makes that happen. This course provides an overview of the most important factors that govern a good sound. The course has a strong emphasis on the importance of cooperation in which the performers must work with those who manage the sound. It is only then that one can make it sound really good. This course has a first portion consisting essentially of PRIMO above but which also handles how to manage the console technically. If you have a mixed group, those who do not work directly with the technology to be in the first part but where such sound engineers are involved throughout the course. This course provides an overview of the main factors that control the major factors behind a great sound. The course has a strong emphasis on the importance of cooperation in which the performers must work with those who manage the sound. It is only then that one can make it sound really good. This course has a first portion which essentially handles the basics (DUO VOX above) but which also handles how to manage the most important part of the acoustics of the venue and how this often is measured and what actions you should take in order to achieve better acoustics. If you have a mixed group, those who do not work directly with the technology to be in the first part but where such sound engineers and those responsible for the acoustics are included throughout the course. This course is an advanced course for those who have taken the course TRIO – VOX . A focus is given on digital mixing consoles because they have many opportunities but can also provide new challenges. The course goes deeper into how the psychoacoustic effects such as masking and “completion” affects the sound and how this should be handled at the mixing console. Many examples are given of how to avoid people who hear badly affected by not being able to hear and/or can not remember the contents of the worship which they participated in. By understanding what needs to be done and work on this at the mixer can improve the sound considerably. The course has many practical elements why much of the time is spent in front of the console ( video camera makes everyone look what happens). The course also covers different types of filters that are common and their pros and cons, both analog and digital. Unexpected side effects of the filter are discussed as well as how to deal with this . Although microphones including recommendations how to work both indoors and outdoors will be treated and how to measure sound . The course helps most behind the mixing desk to better understand what to do to create the best sound possible with the sound system you have. In addition to this treatment even hearing loop and how to install it to avoid trouble and get a good sound. Pre-knowledge: TRIO-VOX plus an interest for a great sound and what makes that happen. The picture to the right illustrates how the different modules looks like. TRIO is the most complete course for the sound engineer and actors who want to know both the background about what makes good sound, how to “dials” the mixing console and other audio equipment, as well as more about room acoustics, measures and measurement methods. 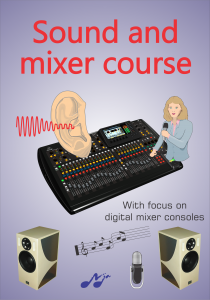 Mixer-VOX is an advanced course for sound engineers where even digital mixing consoles handled. Course modules can be adapted to days and evenings available to as many people as possible will be able to participate. Course participants will receive a certificate after completing the course. Contact us for more information. We have provided these courses over a number of years along with the Form. However, we are flexible and can provide these courses along with any group or separately. We also have a number of courses at a more advanced level, even for doctoral studies if desired. The continuous “thread” is a focus on getting the student to understand the realities associated with the experience and the physics and/or mathematics who are often the explanatory model to use (without going into the mathematical formulas). These more advanced courses are often given along with STF Engineering (http://www.stf.se/), Technical Colleges and/or international expert groups. Noise and vibration experts tex National Theatre, NASA, Husqvarna, ABB, Scania and many other groups have joined these courses and had very good grades.